Jane Orlock Bawel, or Janie as most people know her by, is a lifelong resident of Downers Grove. She is a 1981 graduate of Downers Grove North High School. In 2003 Janie and her husband Brandon blended their families, Janie's 3 and Brandon's 2, and resided in Downers Grove. Janie worked in medical sales and Brandon owns Remes Auto Body in Westmont. It was in September 2005 that Janie learned she had STAGE 4 Non Hodgkin Lymphoma and was in need of immediate treatments. Janie went through 8 months of chemotherapy treatments and was in remission until July 2006. It was then that she learned her cancer had returned and this time it was an aggressive blood cancer that required her to undergo an Allogenic Stem Cell Transplant that would save her life in March 2007. It was also then that it was determined Janie could not return back to work. Their wonderful group of friends, who are also motorcycle enthusiasts, wanted to help and put together a fundraiser they called Ride Janie Ride. It was a wonderful success not only financially but most importantly emotionally. It was decided that the experience they received needed to be shared among the community and others battling cancer. That is when the Ride Janie Ride Foundation was formed. Janie is the namesake of the Ride Janie Ride Foundation. Janie remains in remission and along with Brandon and their now grown children; she enjoys their 3 grandsons, 2 Aussie pups, and continuing to help others. I have resided in the Western Suburbs since 1984, having moved here from South Texas to complete college. Since 1989 I have been at Remes Auto Body in Westmont, having been the owner for the past 20 years. In 2003 I married Janie Orlock, blending our families: Chuck & Brooke Bawel and Jason, Tim & Melissa Happel. Following the initial Ride Janie Ride event in 2007, which was put on through the vision and thoughtfulness of several friends, Janie and I knew that we had to "pay it forward" and keep this "thing" going. Having seen the ugly face of cancer through the eyes of a spouse and caregiver, I also became a patient/survivor in 2012. My diagnosis of "squamous cell carcinoma of the mandible" required extensive surgery to resect and reconstruct my jaw utilizing my left fibula. This was followed by six weeks of daily radiation. I'm blessed to say that more than six years later, I am still cancer free and more empathetic than ever with those who are going through the fight currently. Luke is a thirty plus year IT professional concentrating on Cloud Architecture. After learning of Janie's illness and the need for both financial and emotional support, he helped organize a motorcycle charity event to help raise funds for her out of pocket expenses. His intentions were to execute this single event and hope and pray for the best outcome for Janie. He was thrilled when asked to help organize future cancer benefit events for those in need. 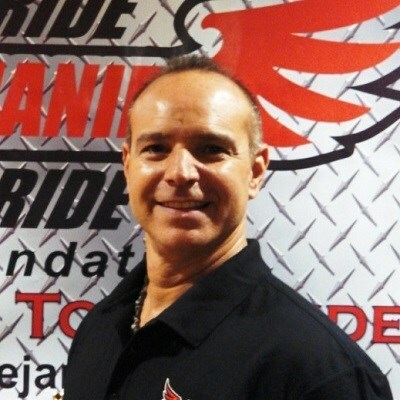 In September of 2007, he was named Director of the Ride Janie Ride Foundation and organized the first Board of Directors. 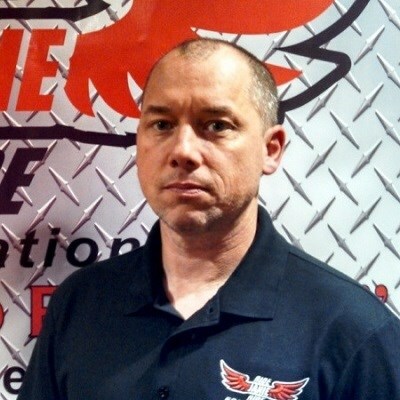 He is an avid motorcycle rider and father of three wonderful children. Organizing charity events is of high importance to him as he believes paying good fortunes forward is an action every person should be a part of. Teresa Smets has been in the accounting business for over 40 years and has her own business for over 30 years. When she learned of Janie's illness, she reached out to Luke to offer her help. She has two terrific grown children and has been blessed with two beautiful granddaughters. Since 2007, Teresa couldn't be more fulfilled; Ride Janie Ride is an organization of hardworking volunteers that give endlessly from their hearts. She appreciates each and every one of them. Don Tommasone is the owner and operator of Village Automotive in Westmont. Don has been with Ride Janie Ride in some capacity since the first ride. Don built a custom motorcycle and donated all the raffle ticket sales to the foundation. He has played a major role on ride day as the auctioneer as his big personality plays perfectly into this task. Don is a husband to Pam and father of three to Dominic, Gianni, and Ava. He enjoys water sports, motorcycling, and is an avid car buff. Marty McGuire is a co-owner of KCM Packaging in Woodridge and a two-time cancer survivor. He became aware of Janie's illness and need for support while she was fighting her own battle against cancer through his high school friend and fellow board member, Dom Tommassone. 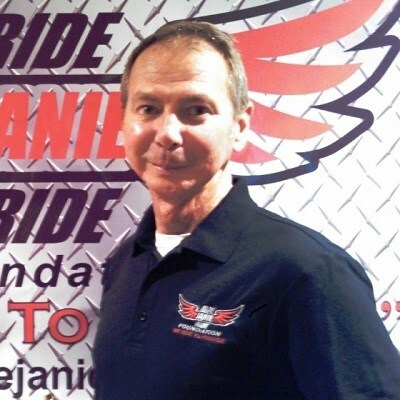 Over the years, Marty and his family have increased their involvement in Ride Janie Ride and he was asked to join the board in 2013. 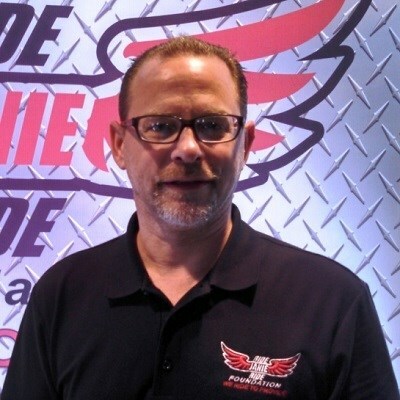 Marty is an avid mountain biker, car enthusiast, and advocate for those battling cancer. He is a father to two daughters, Parker Jo and MacKenzie who are also engaged in fundraising activities at their schools. RJR has been an incredibly meaningful and rewarding experience, and Marty is committed to raising funds through the organization to help families in need of support achieve the same positive outcome both he and Janie have experienced. Arlene has worked as an Accounting and Income Tax professional for the past 22 years and is also an avid motorcycle enthusiast in her spare time. In 2006, Arlene along with her husband David, joined the Wild Fire H.O.G. Chapter (Harley Owners Group), a local Harley-Davidson chapter in Villa Park, IL. Soon after, Arlene and David went on their first ride with their new riding friends which happened to be the Inaugural Ride Janie Ride in support of the foundation's namesake, Janie Bawel. That day forever changed their lives and they both have since participated in every Ride Janie Ride event in different capacities. 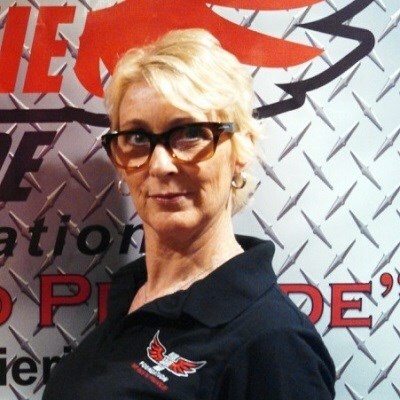 Arlene, through her passion for the Ride Janie Ride Foundation and the members of the Board, has since become a Board Member for Ride Janie Ride as the Foundation's Secretary and is also involved in RJR's merchandising. Arlene has lent her professional skills in the capacity of Treasurer for 5 years, serving as a Primary Officer for the Wild Fire Chapter, and for 2 years at the state level for the Illinois State H.O.G. Rallies. 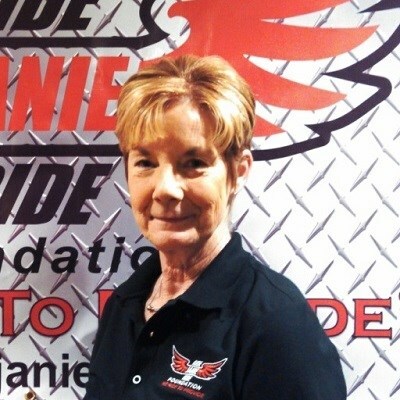 Giving back through charity is Arlene's passion, and she looks forward to continuing her service to the Ride Janie Ride Foundation. 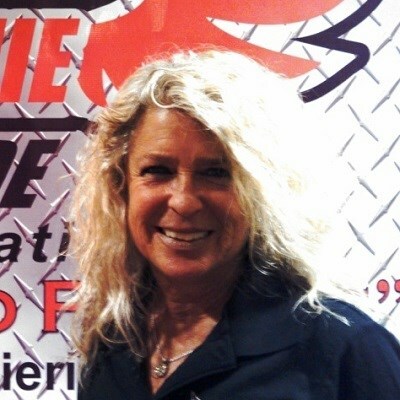 Arlene, along with her husband, relocated to Houston, TX in May 2016 and enjoys warm weather nearly 365 days a year and a much longer motorcycle riding season, as well as earning many travel miles back and forth to Chicago for every Ride Janie Ride event, her family and her job located in Schaumburg, IL.